Davis frames the symphony's doomed heroism with real feeling in a performance rich in evocatively etched detail, Mari Eriksmoen’s soprano ethereal and haunting. 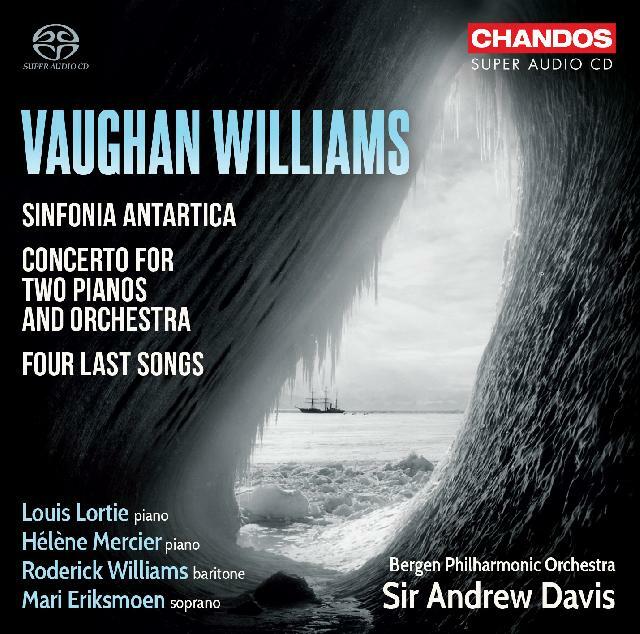 The Chandos survey of Vaughan Williams’ symphonies begun in the late 1990s by the late Richard Hickox reaches its conclusion with a fine account of the fierce, chilly lament of the Sinfonia antarctica by the Andrew Davis-led Bergen Philharmonic. A portrait of courage in the face of lethal odds, it is also a shiver-inducing portrait of biting winds, snowy wastes and life-sapping sub-zero temperatures. Davis frames its doomed heroism with real feeling in a performance rich in evocatively etched detail, Mari Eriksmoen’s soprano ethereal and haunting. There’s contrast aplenty in the angular effervescence of the two-piano version of the Concerto. Hélène Mercier and Louis Lortie treat its restless shifts of mood with nuanced attention, supported by the Bergen forces with duly muscular poetry. A first recording for baritone voice of Anthony Payne’s 2013 delicate orchestration of the Four Last Songs accents autumnal lyricism, Roderick Williams beautifully understated and characteristically moving. Excellent sound and notes by Stephen Connock contribute to an essential disc for VW devotees.